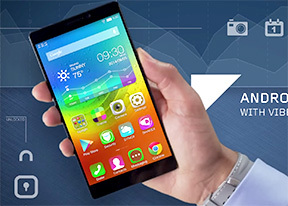 The Lenovo Vibe Z2 Pro sports a 6" IPS LCD screen with a 2560 x 1440 pixel resolution. The pixel density meter stops at the eye-popping 490 ppi. The company has given you a lot of control over its image quality by including a special menu to adjust the display modes. There's the standard configuration, comfort, super bright and the option to manually adjust saturation, tone and contrast. Finally, you can switch on the Smart brightness option if you want the phone to detect any hard lights hitting the display and adjusting its brightness automatically. The display is covered with a protective layer of Gorilla Glass 3, making it more resistant to breaking and scratches. The matrix is a standard RGB type with an equally sized red, green and blue pixels. Here's the display matrix of the Lenovo Vibe Z2 Pro shot with our digital microscope. 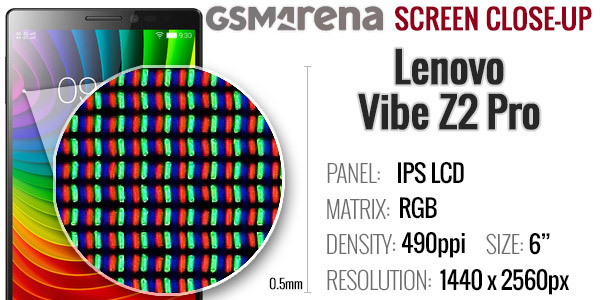 The black levels of the Vibe Z2 Pro display are good and the brightness is adequate at both 50% and 100%. However, the contrast is only average and the colors are a bit too saturated for our taste. Viewing angles are very good with very little shift in color and contrast. You'll have no problems viewing the display of the phone in direct sunlight, too. Since the Vibe Z2 Pro has a lot of space inside it, Lenovo has managed to fit a whopping 4,000mAh battery. And while that number is certainly impressive, it's worth pointing out that it's not the largest in the segment - the Huawei Ascend Mate 7 sport a 4,100mAh battery. Still, we are very pleased with what the power autonomy of the Vibe Z2 Pro. We ran our usual set of battery tests: 3G talk time, video playback, web browsing and stand-by. While the huge pixel-dense screen meant scores in the video and web browser department were good, but not quite record-breaking, the excellent stand-by endurance gave the Vibe Z2 Pro a solid score of 76h. You can find more about our battery testing procedure here. On top of that, the company has baked in a handy power manager app. It gives you a clear reading of what battery power you have left and an estimation of how much usage it will give you. There are also three modes you can pick from: normal, power saving and emergency. Power saving mode will block apps running in the background and also downclock the CPU a bit to make the phone more economical, while still retaining most of its functionality. Emergency mode goes a bit extreme by enabling only calling and messaging. Anything else on the phone is disabled, allowing it to spread that remaining charge over several hours or even days. Another cool feature of the Power manager app is the Power saving engine, which optimizes the phone's brightness by using "sine wave power-saving technology". Lenovo estimates it can reduce power consumption by 5-30%. There's a similar option for the GPU and its power reduction goes as far as 25%. If you want to get even more juice out of the battery, the app allows you to schedule a timed shut down of the phone. You can freeze apps and see a detailed graph of the power consumption. The latter is separated into software and hardware. The software part is akin to the stock Android battery graph, while the hardware shows you how much power the CPU, screen, radio, Wi-Fi and other hardware components draw out. Finally, there's the option to optimize power consumption. The button is located at the bottom and upon pressing it the app detects what draws the most power and offers you advice on how to fix it. 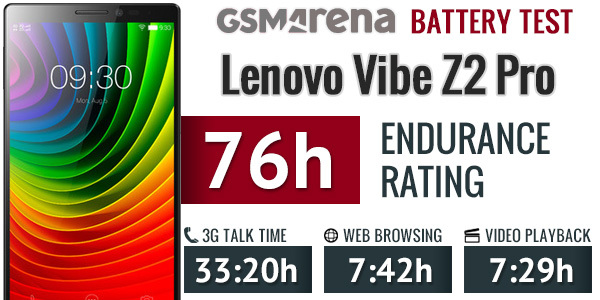 It's clear that Lenovo has turned special attention to getting the most out of the Vibe Z2 Pro battery. The Lenovo Vibe Z2 Pro comes with truly global quad-band 2G/GPRS/EDGE and penta-band 3G with HSPA (up to 42Mbps downlink and 5.7Mbps uplink). The six-band Category 6 LTE support (50Mbps of uploads and 300Mbps downloads) is not the best around, but it still covers plenty of big names in the 4G business. The phone is available in single SIM a Dual SIM configurations. The latter has a dedicated SIM management section in its settings menu. It allows you to choose which SIM card is active and the default SIM to place voice calls, use data connection or send messages. Local connectivity is covered by dual-band Wi-Fi a/b/g/n with DLNA, so you can easily play media (photos, videos, music) from DLNA-enabled storage devices or push content from your phone to a DLNA-compatible TV or music player. There's also a Wi-Fi display app to connect the phone to an external display using Micracast. GPS and GLONASS support is enabled. There's an FM radio and NFC on board, leaving infrared blaster as the only connectivity feature missing.